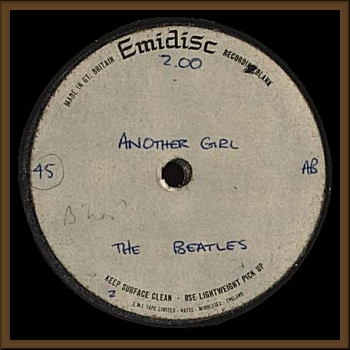 This disc was auctioned by Christies in September 2005. I have no info for this specific disc. other thatn what is presented by the auction description. It seems logical that thsi is RM1. However, a point of interest is the 2:00 time length of this disc as opposed to the 2:05 on the acetate seen here. That probably doesn't indicate an alternate mix but simply some variable such as a slight inaccuracy between the timings, an early fade-otu or a variance in the tape speed.